British Gas customers will see their electricity bills increase by 10.4% from 23 November, the energy giant has announced today. Gas prices will rise by 8.4%. The price rise, which comes after SSE became the first to announce energy tariff hikes last week, will affect almost 8 million customers. Dual fuel bills will go up by 9.2%. With energy prices rising faster than incomes, the news, however much expected, will be a blow for energy consumers. E.ON, npower, EDF and Scottish power – the remaining ‘Big Six’ – will surely be following in British Gas and SSE’s footsteps, hiking their tariffs before winter arrives. It’s a question of when, rather than if. uSwitch energy expert Tom Lyon is advising energy customers to look into locking their energy prices by switching to an energy plan which fixes their gas and electricity prices for a specific period. It’s a practical solution if you want to avoid falling foul of subsequent price rises. Simply ditching your current tarrif and switching to a cheaper one isn’t enough anymore. “There are some great fixed price deals on the market which can protect you from price hikes for anything up to four winters,” explains Tom. “As well as reducing the cost of your energy, now is also the time to reduce the amount you use – not by going cold, but by making your home as energy efficient as possible,” he added. Energy efficiency really is the key to keeping bills down. 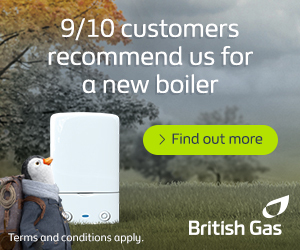 Check to see if you are eligible for a Government grant to replace your old boiler. Grants are also available for loft and cavity wall insulation, if you meet the qualifying criteria.